Reina was sitting at an evening lounge, at a bar that was relatively high-class and uncrowded. Most bars weren’t busy these days–there were just not enough people to fill them and yet they stayed in business because those people who did enjoy them, enjoyed them well. She stared into the Sombrero Cosmo resting on the table in front of her, she ran the tip of a finger up the fragile stem of the glass as a tiny pool of condensation collected on her nail. She absently sucked it into her mouth. There was something wrong with her cosmic drink, and for a moment she laughed internally. All drinks were made in tribute to the universe these days. But hers was strange, the liquid inside was made in a way to depict the Sombrero Galaxy, a manipulated alcoholic image with a billion sparkling stars orbiting the outer ring. When Reina looked closer, she saw that the stars weren’t orbiting, they were swimming, wiggling ever so slightly, moving in an impossible way. She leaned closer to inspect it. A movement caught her attention out of the corner of her eye, disrupting her reverie, as a large, wiry man hit the chair next to her. With a brazenness she didn’t believe she possessed, she looked around the bar and rudely analyzed all of the empty seats this man could have taken before her eyes narrowed on him. Reina leaned away from the nonchalant power the man omitted. He wasn’t human but he looked human. He was definitely not a Trentian–his coloring was normal. He wasn’t quite right, his voice too low and steely, his size too imposing, even the way his hair fell in short locks around his face was odd. She watched as the bartender slid him a chilled glass of amber liquid. The man was sitting right next to her, invading her personal space, and she could barely breathe. He caught her eyes as he took a sip of his drink. When she thought about it, there was so much space between her and everyone else, that even if this man had sat on the other side of the room, she would have felt invaded. The inhuman man sat his glass down and smirked. Reina looked back down at the wiggling cosmo again. The perverted stars now bled into the liquid everywhere, destroying the image of the galaxy as she watched. Destruction ensued. “The stars aren’t real,” she whispered and jerked back as the strange man placed his hand over hers on the bar. He tightened his hold until she stopped struggling to reclaim it. The exchange didn’t take long as a warm current streaked up. The heat came from him and it soothed her in an unexpectedly welcome way; the pounding of her heart eased. Reina relinquished her hand to him and watched as he moved her drink between the two of them. She looked up at him then back down at their joined hands. The heat coming off of his skin was beginning to burn, but it was a cleansing burn. “Your cells.” He lifted the glass to her lips and tipped it up; she swallowed the horrifying liquid, feeling streams of liquor slip down her chin and splash on her thighs. Reina fell back and gasped, only to be caught up in his arms. He was a heavy metal wall trapping her against his body. A calm settled over her as the drink spread through her body, her bloodstream. “Thank you,” she whispered before blacking out, feeling a safety with him that she had never felt with any other person. Even in a very unsafe situation. I love this cover! And I’m glad I do because my friend and I spent more hours than I bothered to count working on it. Actually, now that I think about it, it might have undergone more drafts than the book itself. Thank you, Cameron, my photoshop certified guru! Keep an eye out for Reina and Atlas’s quest to go beyond the reaches of the network and discover why countless ships have disappeared. Coming soon! Stranded in the Stars: Book 3 Blurb Release! Reina stopped caring, and she doesn’t know why. After years of working for the Earthian Space Fleet, spending her days in quiet anticipation as a back-up pilot, doing her work well, if indifferently, she comes face-to-face with an alien man who tries to bargain away her free will and make her his bride. Furious and unsure whether she should fight for a life when she was just going through the motions, Reina is approached by her superiors and asked to captain the last mission into the abyss. To prove to herself that she is worth more than a breeder, that what she has built is something to be proud of, she hopes that a reckless adventure may just quiet the fear she holds close to her heart. What does a Cyborg do when he has the power of the entire network? When his actions could alter the course of the universe? And his only obstacle is a woman in desperate need of his help? Atlas is the best navigator for the Intergalactic Earthian Council and has been working for them for decades in hopes that they will free him. But when the Council forces his hand, the now sentient intelligence must undertake a mission that could irrevocably destroy his conscious mind. A mission that could force him to transcend his half-life state in order to protect the beautiful, lost captain that he would risk a second-death to claim; and to feel under his fingertips. 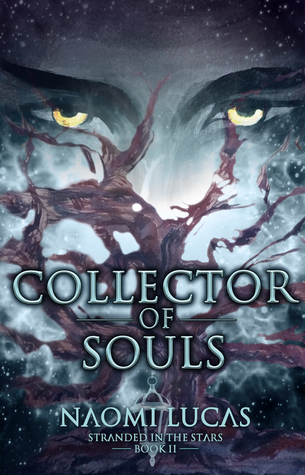 Collector of Souls, Stranded in the Stars Book 2: Is now live! It’s finally out. I had Ophelia’s story in my head from the beginning of when I started writing Last Call. It should answer many questions from book 1. I hope you guys find it an enjoyable read! Ophelia is a half-breed, half-Earthian, half-Trentian. She was raised on a backwater planet on the outskirts of a Trentian controlled sector, on a planet that was so far out in the fringes that the intergalactic council barely knew of its existence. One day changed her life. When she was brutally examined to see if her body was viable to procreate– she was found barren. Running from the news, the terrible confession of her womb, the brutality of her situation, she finds herself willing to give up her soul for a second chance at life. What does eternity mean to a girl who doesn’t understand the concept? When she accidentally summons a mystic force from the ancient ages of Earth? When science and the supernatural collide? Seraph is a Soul Collector. His eternal profession is to bargain for the souls of the living in order to control their ether in the afterlife. He has been sitting dormant for millennia as his profession phases out with the Age of Science, the Age of Space, and the Age of Intergalactic travel. When he is summoned from his realm by a dying half-alien girl, his static existence takes a turn for a techno-supernatural adventure. Last Call (Stranded in the Stars Book 1) has been thoroughly revised by myself and a hired editor, in hopes to give any return readers and future readers a cleaner, easier read. If you have purchased the book previously, just go into your digital content on Amazon and upload the latest version. The updated version is live as of 10/7/2016. They were all huddled together, hidden in a room that overlooked the courtyard. Every maiden was present to watch and mourn as their sister-mates were paired off with men. But no one was peering through the shuttered windows. Every girl sat away in sullen silence, even the ones who envied those outside. They formed a temporary hive mind. And for just a moment in time, Ophelia felt truly connected to the world around her. And the situation they were all in. The tension, excitement, and the great unknown left each one of them wrecked. Today was not a happy day. Today was one of great loss. Silver spears of light flooded through the cracks and it made their gathering appear somber. They sat outside the rays. The light was bright enough to burn the eyes. Unlit, unused candles sat around, forgotten. The shadows were thick in the corners but there was no sign of him. She hadn’t felt his presence since this morning. Ophelia sat at the back and watched her sisters. Romana, one of the girls, was fidgeting. Trealé was silently crying. Sasha paced back and forth in silence, her movements scattering motes of dust throughout the air. Most of the girls appeared closed off and solemn while they waited; she looked over at Allie. Her friend was closest to the windows. She was the only one brave enough to look out and report upon the proceedings. Allie would peer out and quickly look away, her face continuously fluttering between emotions; pinched with worry or reserved and shut off. Ophelia felt guilty because she couldn’t keep her mind on the events at hand. The gloom was a thick haze around her and for once she was excited by the dreary atmosphere. At one time it scared her, but as her shadow came from the darkness, it now excited her. She wanted to ball up in a dark corner and pretend he was that dark corner. Ophelia had been rolling Seraph’s name over her tongue all afternoon. She had hummed it in her mind like a lullaby. It brought a warm blush to her skin. Where is he? Her eyes scanned the shadows for the hundredth time. He had vanished like a dream. Allie paced back to the crack and looked out. The maidens held their breath but after a moment, her shoulders sagged and she moved away. The mood settled back into dormant anticipation. “What’s happening out there?” A girl asked, the young one who had only been within the ward a short time. Too young to even be here. Kids don’t belong in a breeder’s prison. Ophelia rubbed her pelvis in disgust, a prickling pain bloomed at the thought. “The crones are sprinkling petals over the walkways. One is moving to each corner of the garden with a stick of incense.” Allie answered. “How can you not know? Does this not happen often?” The child-maiden demanded and looked out the window herself. “Not for two years… and not with so many girls.” Romana answered sullenly. “There’s not many of us. Only two were paired off the last time.” Romana went to the younger girl and pulled her back into the room. Ophelia’s curiosity was piqued by the conversation. “Why so few?” She asked. No one answered her for a heartbreaking minute. “Shortages in everything…” Allie whispered. Hey all! Very excited to release the book cover art for Stranded in the Stars, Book II! Some blood, sweat, and laughs went into its creation.